We want to be rich. We do not want to be poor. In Luke 6:17-26, however, Jesus takes that normal desire and turns it on its head. 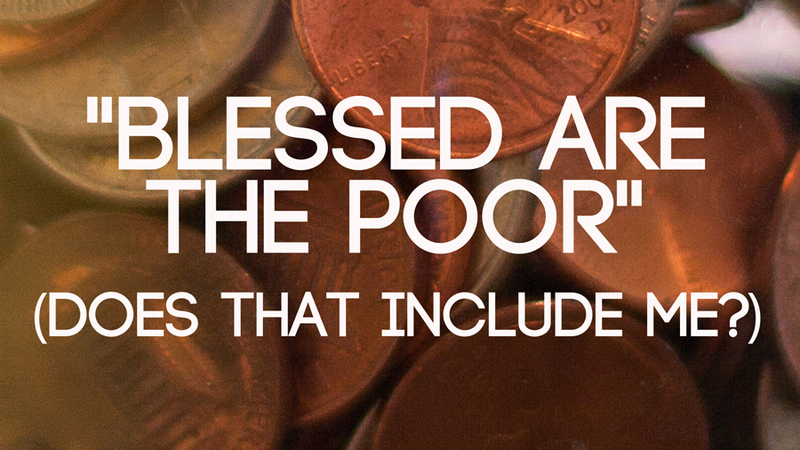 He says the poor are blessed, while he says “Woe” to the rich. To understand why in the world he would say that, we need to take a look at those two terms: Blessed and Woe. Blessed is basically the word “Happy”. Some Bibles actually do translate it that way. And why is the person happy? The definition says that it implies that the person is happy because they are enjoying favorable circumstances. So you would normally use this word to describe the emotional state of someone who is going through a good time. They are happy. But look at the circumstances that Jesus describes. They are poor, they are hungry, they are weeping, people hate them, exclude them, insult them, and call their name evil. Nice, right? Good times! We look at that list and don’t want any part of it. I am not a fan of any of the items on that list. You? Who really, truly likes being poor, hungry, weeping, and despised? The prevailing opinion in the world back then and still today is that those are bad, bad places to be! I wonder if any single person in the crowd that day believed him? I can see them perking up though. Especially as he goes on to say, “Woe to you wealthy people”. The rich are not enjoying favorable circumstances, Jesus says! Instead, they are in terrible horror. Anyone else thinking what I’m thinking? “Jesus, are you serious?” Is he basically saying here that if you’re poor, you’re going to heaven and if you’re rich, you’re going to hell? It could really sound like that, couldn’t it? In that day and age, the prevailing notion was that poverty meant God was cursing you, and wealth meant God was blessing you. Health and wealth, to that audience, meant that God was blessing them. Many of us feel the same way! And Jesus comes along and turns that idea totally upside down. He goes on to say that if you are well fed now, if you are laughing now, if you are popular now, you are getting your reward now. You are loving life now. But a day will come when things won’t be so fun. So does this mean we are supposed to live lives of poverty? If so, we American Christians are pretty much done for. If the measure is health and wealth, most American Christians have already received their reward. So what do we do with Jesus’ words? We read this stuff, and we very, very quickly say “Well, he didn’t mean that.” We like Matthew’s spiritualized version better. Luke’s version confronts us pretty hard, doesn’t it? Maybe we want to take Luke’s version, throw it in the trash, or spiritualize it, and then, whew, we are off the hook. Think about it, we make delicious, indulgent meals all the time. We laugh a lot. At lip sync concerts. We are entertainment happy. Would Jesus say, “Woe!” to us? As I was studying this I had to ask, “Jesus, why in the world did you say all this stuff?” It is very hard to hear his words from a wealthy American context. If you are a Christian, say, in one of my denomination’s sister EC Churches in Liberia, Africa, where it is super poor, where your country has had nothing but civil war and poverty and Ebola for the last 20 years, you probably hear this passage and jump for joy. But you and I…what do we with this? First and foremost, Jesus is not teaching about how to get to heaven. Instead Jesus is speaking very provocatively, which he does often, to get our attention. He was a master of that. Educational theorist Jean Piaget called it disequilibration. What happens to a pond whose waters never move? It gets stagnant. Piaget basically said that happens to our brains. Our brains need to be moved, challenged. To keep a pond from stagnancy, you need to throw rocks in that pond, create wave ripples. Jesus is throwing rocks in the pond of a very stagnant culture. So remember this rock he once threw into that stagnant pond? : “It is harder for a rich man to enter the Kingdom of God, than it is for a camel to pass through the eye of a needle.” Remember that? Splash! Is Jesus saying that being wealthy is inherently bad? No, he is just speaking what is so often true, that we can get very dependent on our wealth, we can become addicted to our technology, and we can become distracted by our comforts and entertainment. We can allow this stuff that we love to turn our hearts and minds away from God! That’s why another time a rich man came to Jesus and said “What must I do to be saved?” And you know what Jesus said? “Sell everything you have, give it to the poor, and come follow me.” But the guy couldn’t do it. He was too connected to his wealth. He couldn’t let it go. That guy had no idea that following Jesus was better, way better, by far! Now here’s the question, is it possible for a wealthy person to depend on Jesus and truly follow him? Yes it is. But Jesus is at least saying that it is very, very hard. But it is possible. Many times on this blog, I’ve mentioned John Wesley’s, phrase about wealth: “Earn all you can, Save all you can, Give all you can.” We’ll talk more about this in the next post. But let me introduce it here. Wesley is saying that we should earn all we can, and for some of you, hard work, using the mind and body God gave you, will result in wealth. That is a good thing! So earn all you can. But also save all you can. By that Wesley meant “don’t spend it on yourself.” Amass wealth, yes. But be careful, it is very, very easy to start spending that wealth on the so-called good life. Wesley says, save it. Don’t spend it. And next week we’ll see why. So Jesus said these blessings and woes to that crowd that day because he wanted them to understand what is valuable and important in God’s eyes. We are so accustomed to the values of our culture. The crowd that day 2000 years ago in Palestine was likewise accustomed to judging things based on the values of its culture. In First Century AD Israel, the value was that if you are poor, God was cursing you, and if you are rich, God was blessing you. It was basically a health and wealth Gospel. Jesus says that we need to use the values of the Kingdom of God to evaluate our lives. Will we make our financial decisions based on our culture or based on Christ? We will make our decisions for how we spend our time based on the mission of God’s Kingdom? If we simply spend our money and our time on ourselves, Jesus says, we have gotten our reward here. He is saying that we should be a people who desire God’s rewards! I will recommend this: accountability. Will you consider submitting your life to an older, wiser Christian who loves the Lord, who is willing to speak blunt truth, and lay everything in your life open before them? Jesus is saying that it is not correct to view wealth and health as blessings from the Lord. You might be poor and sick, but if you follow him, there is hope, because one day you will get your reward. Make your life about following him and the mission of his Kingdom! Instead, be people who give your time, your talent, your treasure sacrificially to God and the mission of his Kingdom.